Gamera vs. Zigra (1971) Review – AiPT! We’ve come to the second-to-last installment in the Showa era Gamera series, and the last “real” installment, as the next film will be a clip movie. Unfortunately, while Gamera vs. Monster X was a revitalizing breath of fresh air in the series, Gamera vs. Zigra is the biggest bore since Destroy All Planets. Just watch the Mystery Science Theater 3000 version of the flick. It’s the only way. Man has conquered the moon and will soon be traveling to distant solar systems. Unfortunately, such technological prosperity has attracted the wrath of an evil race of conquering space aliens. The Zigra, hailing from the planet Zigra and under the command of the shark-monster Zigra, proceed to kidnap humans and threaten the sanctity of Sea World. Yes, Sea World. Gamera, friend to all children, is summoned to protect the Earth and go one-on-one with the space-shark Zigra. But will Zigra’s hypnotic powers be the end of Gamera!? Gamera vs. Zigra is sort of a mish-mash of ideas from Destroy All Planets and Attack of the Monsters. You’ve got an evil alien race led by an aquatic monster out to conquer the Earth (ala Destroy All Planets), represented by a chick in a space-suit who wants to eat people (ala Attack of the Monsters). There really isn’t anything new to see here. While Gamera vs. Monster X tried to skew things a little bit older, Gamera vs. Zigra overcorrects and offers an extremely juvenile cast and tone, even by this franchise’s standards. The human children (multi-national once again) are elementary schoolers that can’t be more than six or seven years-old. They aren’t very good actors and the little girl hardly seems to even know she’s in a movie half the time. I swear she picks her nose in one scene while all the grown-ups are talking and she’s bored. Most of the movie is concerned with filling time. So you’ve got a 10-minute sequence where a bit character argues with a hotel manager over a basket of fish or a worthless moment where the kids discuss time travel with a hermit. These moments serve no purpose other than to push the film over 80 minutes. The rest of the flick is filled with shtick involving the annoying brats as they lead the evil Zigran chick on a chase around Sea World. It’s annoying and dumb and very boring. You can tell that this installment was made on a fraction of the budget of other Gamera films, so special effects are used sparingly and those we do see are laughably bad. Again, even by the standards of the Gamera series (the Zigran space ship looks like a bowl of Skittles). So how about the monster? As the last original kaiju in the Showa series, Zigra wows us all by being a big shark. And that’s about it. He has a lamp on his snout that shoots a paralyzing ray and his fins are razor sharp. Beyond that? He’s got nothing. Well, that’s not true. He can talk, which is kind of weird. The fight scenes are surprisingly listless for this series, which up until now was pretty energetic with the monster battles. You won’t be seeing any Gamera gymnastics or cool s--t like that; the fights all take place underwater and mostly consist of Gamera standing still and flailing his arms while Zigra swims in circles around him, trying to wing him with his flippers. The only bit of fun that we get is Gamera playing Zigra’s fins with a rock like a xylophone. Then he incinerates him with his flamethrower breath and the humans give us a lecture about polluting the ocean. Ugh. A part of me feels foolish giving a Gamera movie a bad review, because it’s a f-----g Gamera movie and I should know better. What was I really expecting? But the fact is I’ve seen ALL the Gamera movies and if you scale them in relation to each other, Gamera vs. Zigra sits at just about the very bottom. It’s failing isn’t that it’s stupid, since all the Gamera movies are stupid. It’s failing is that it’s boring. Really, really super f-----g boring. 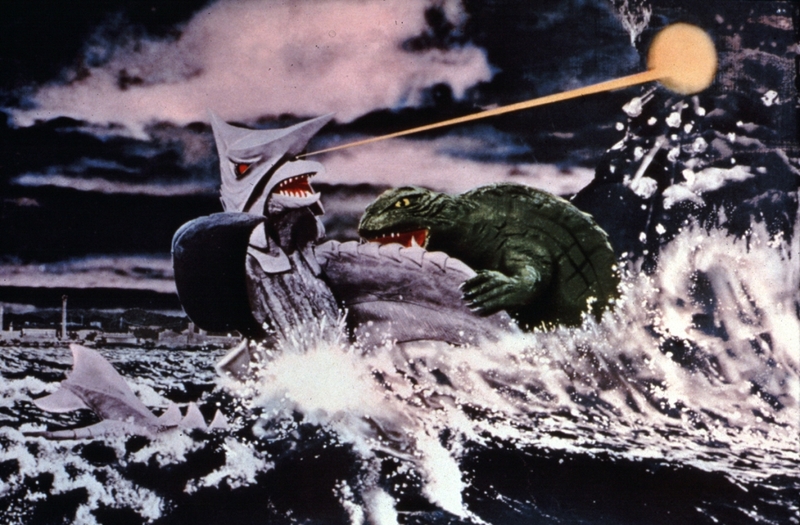 A movie about a giant rocket-turtle battling a flying hypno-shark should NOT be boring.